The MiniPlex-2Wi is an advanced WiFi NMEA multiplexer, combining data from up to four navigation instruments into two NMEA outputs, a Wifi interface and a USB port. It also supports AIS and other high speed NMEA devices up to 57600 Baud. Data from multiple instruments is available wirelessly though a Wifi connection, giving complete freedom where to navigate and control on board. It acts as a wireless access point for your iPad, iPhone or other WiFi enabled device. The internal WiFi access point connects up to 7 devices simultaneously. All devices can receive and send NMEA data simultaneously when using the UDP protocol. UDP and TCP data is routed between devices. A galvanically isolated USB port allows you to connect to a fixed computer simultaneuously. Full galvanic isolation on the USB port, eliminating ground loops between multiplexer and computer which are often on separate power grids. Connects directly to a USB port without the typical USB problems. Plug & Play as it was meant to be. The MiniPlex-2Wi also has a USB port for a fixed connection to a computer. The WiFi and USB connection can co-exist and data can be routed between both interfaces. The USB port is also used for firmware updates and configuration of specific WiFi settings. 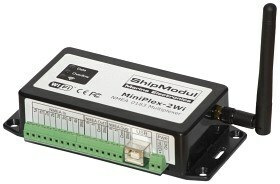 The MiniPlex-2Wi has a rich set of features and configuration options, enabling the user to tackle almost any NMEA bottleneck or interface problem. 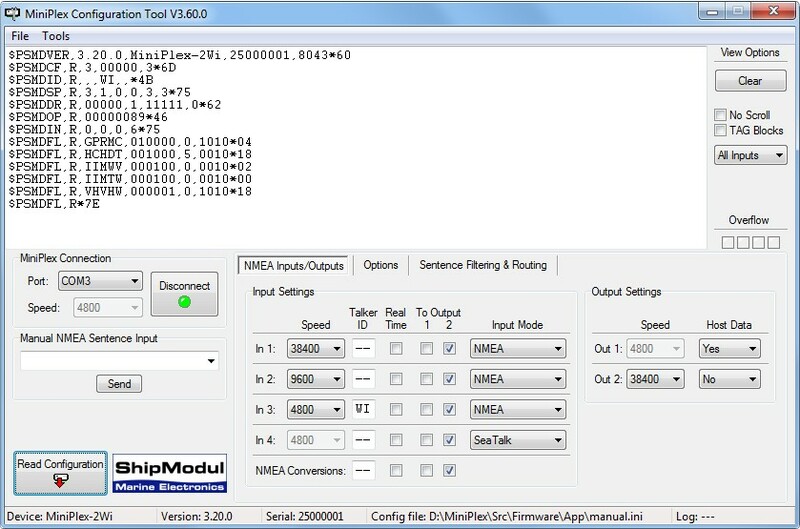 The supplied Windows utility MPX-Config allows full configuration of the multiplexer and monitoring of NMEA data passing through the multiplexer. Priority With Priority enabled, similar NMEA sentences on different inputs are only passed from the input with the highest priority. The WiFi and USB interfaces have the highest priority, followed by inputs 1 to 4, in descending order. When for instance two GPS receivers are connected to inputs 1 and 2, and both transmit the same type of NMEA sentences, only those received on input 1 are passed. An adjustable time-out ensures that similar sentences from the GPS at input 2 are passed when the GPS at input 1 stops sending these sentences. Optionally, GPS sentences are checked for a valid status field, causing automatic switchover when the primary GPS looses satellite signal.